There are films that make you smile and you leave the cinema light heartedly. „12 Years a Slave“ is none of them. In fact this film will tear you apart because there is no mercy, no relieve, it’s brutal and shocking. And it’s the true story of Solomon Northup (Chiwetel Ejiofor) who was born as a free black man and sold into slavery where he only tries to stay alive and find a way back home. But for twelve long years he is nothing more than a working machine in the hand of such slave owners like Edwin Epps (brilliant played by Michael Fassbender) who always is ready to torment his slaves for no reason. But it’s not this brutality, the whipping, the humiliation that moves you deeply. This films gets all it’s strength because there is no moment of relieve, no humour as you may find in Quentin Tarantino’s „Inglourious Basterds“. Of course there are silent, idyllic scenes placed in an incredible beautiful landscape. But you can’t appreciate them because you fear that there will be another cruelty waiting to unfold. 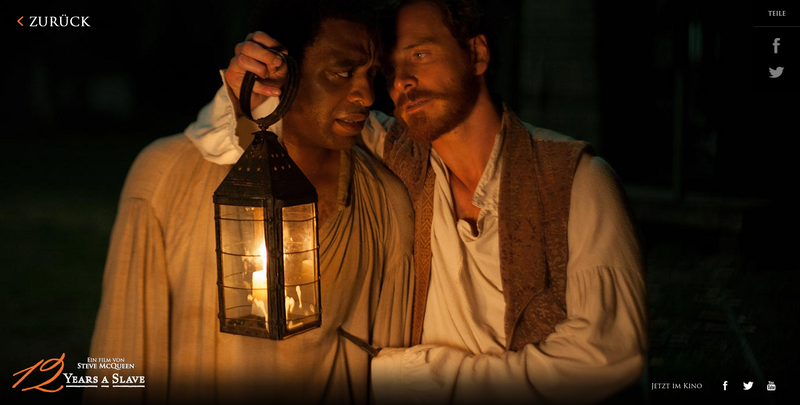 „12 Years A Slave“ is a film that has all the power cinema is able to give. That is because Steve McQueen established a fine ensemble of actors, lead by Chiwetel Ejiofor whose Solomon has the sympathy of the audience. Michael Fassbender’s Edwin Epps literally is the brutality of slavery and the personification of the American South without doubt that white men are born to be superior and may do whatever they want to. William Ford – played by an amazing Benedict Cumberbatch – at least tries to treat his slaves as human beings, but he is not able or not willing to change anything. At least he gives a little bit of hope where there is no hope at all. Because the film is based on the memories of Solomon Northup we do know that he managed to escape but this doesn’t relieves your heart. Leaving the cinema after 135 minutes is like coming back into a world that seems on mute and unreal. But „12 Years A Slave“ is a film you should not miss and it definitely needs all the Oscars it’s nominated for. Eine deutsche Version dieses Eintrags gibt es hier.